47th Jerusalem Day begins, stats show city leads Israel in hi-tech, immigration, and hope. Jerusalem Day, beginning Tuesday night, will be celebrated in Israel's capital through a series of events featuring top Israeli musicians and various performances. This year marks the 47th year since the unification of the 3,000-year-old capital of the Jewish people, which occurred in the 1967 Six Day War. On the occasion of Jerusalem Day, Jerusalem Mayor Nir Barkat stated "the residents of Jerusalem feel the youthful energy coursing through the city, and are enjoying the great wave of development enveloping Jerusalem." "Jerusalem is a modern, attractive and leading city, which attracts young people who enjoy the culture, sport, leisure, excellent education and quality of life that exists only in Jerusalem," added Barkat. "We are continuing to develop the city together with the residents, and are investing all of our resources in developing Israel's capital for future generations. It is a great privilege." Figures from the Central Bureau of Statistics, the Jerusalem Institute for Israel Studies and other sources were released by the Jerusalem Municipality ahead of the celebrations. The statistics indeed support Barkat's appraisal of the capital. While Israeli hi-tech, so central to the nation's economy, is often linked to the central coastal region, revenue from the industry in Jerusalem is in fact nearly 12 billion shekels (around $3.5 billion), almost as much as the revenue Tel Aviv (6.7 billion shekels) and Haifa (7 billion shekels) combined. Jerusalem is also leading Israel in attracting olim (new immigrants). The city absorbed 2,335 new olim in 2013, making 13% of the national total of olim, and over twice as many as Tel Aviv (1,060) or Haifa (1,130). The capital has also been attracting young people, as 30,000 people young people have moved to the city in the last four years. 51% of those moving to Jerusalem in 2012 were between the ages of 20 and 34. While the Central Bureau of Statistics reported 88% of Jerusalemites are happy, the Municipality figures found 92% of residents are happy with their lives, as compared to an 88% national average. Tel Aviv came in at 86% and Haifa at 81%. Jerusalem residents were also found to be the most optimistic in Israel: 63% felt their lives would be better in the future, a rate higher than the national average (59%), Tel Aviv (57%) and Haifa (54%). The last four years have also seen a marked growth in Zionist state and state-religious education systems, with students rising from 58,908 at the start of the 2010-2011 school year to 62,941 in the 2013-2014 school year. Building was also touted in the Municipality statement, which noted a record number of new projects began in 2013 breaking a 20-year record. In the last three years construction on 15,651 new residential units have been approved throughout the entire city. 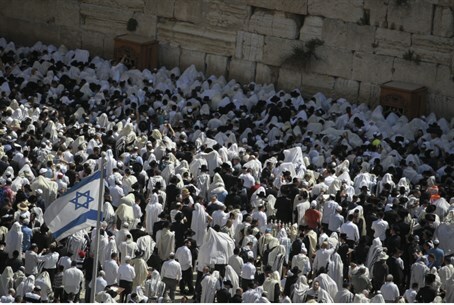 Roughly four million tourists stayed in Jerusalem during 2013, outpacing Haifa and Tel Aviv in that category as well.